It is sometimes necessary for a developer or tech support to request console log messages from Rhino to diagnose a bug or crash. In Applications > Utilities, start the Console program. This can also be found from Spotlight or Launchpad. In the left column, click All Messages. In the Filter box, type rhinoceros. 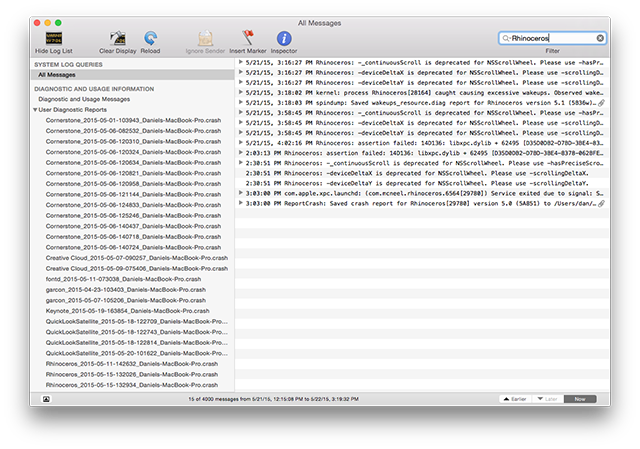 You now have a number of log messages about Rhino. A number of messages probably with nearly the same date and time. Click the latest one, and scroll to the earliest message you want to send to McNeel. Shift+click this message to select all the messages in between. Press Command+C to copy the messages. Paste the messages into the body of the email. Include an explanation why you are sending us these console messages. Send this to tech@mcneel.com with a descriptive message.